If you don’t measure it, you don’t manage it. Benchmarking is the search for the implementation of best practices. A continuous systematic process for evaluating the products, services and work processes of organizations that are recognized as representing best practices for the purpose of organizational improvement. Benchmarking allows your organization to see what others are doing, what is working for them, and what to avoid. "'the process of identifying, understanding, and adapting outstanding practices and processes from organizations anywhere in the world to help your organization improve its performance." The search for industry best practices which lead to superior performance. An ongoing process of measuring and improving business practices against the companies that can be identified as the best worldwide. Involves internal and external measurement of products, services and processes. Leads to better practice and improved performance. Helps to establish realistic improvement goals. 2. What is Best Practice? An activity or procedure that has produced outstanding results in another situation and could be adapted to improve effectiveness, efficiency, ecology, and/or innovativeness in another situation. Produce superior results. Superior is defined as 25 percent of higher results than the normal output. Be a new or innovative use of manpower or technology. public domain sources have referenced this practice). Have received an external award for this practice. Be recognized by their customers, suppliers, and industry experts. Best Practices allow companies to outperform their competitors and peers in specific operational areas…and deliver more value at less cost. They are practices that enable a company to become a leader in its respective marketplace. Best Practices are not the same for all situations; it is determined by business conditions, not by a fixed set of business practices. in the future even a poor practice. No single best practice company will be found. All companies have strengths and weaknesses. Because the processes that are in need of improvement through benchmarking vary, the companies identified as the Best will also vary. "Relates to a company's particular areas of skill and competence that best contribute to its ability to compete"
Activities, transactions and attributes that are selected from accepted benchmarking practice measurements and from unique internal operations that represent the performance of the operation and which are used to compare and measure performance toward achieving the department’s vision and best practice. Economies and efficiencies indicators that are easily quantifiable and lend themselves to statistical measurement and reporting. Identifiable operation's attributes can impact its success. These can include: Customer satisfaction levels, defined skill sets, training, documented procedures, etc. These relate: to areas that define the core activities, values and belief system of an organization and can represent a broad range of subject matter anywhere from business priorities and innovation through to social responsibilities and ethics. codes of conduct, quality of work life statements, statements of moral responsibility and positions on social and environmental issues as well as organizational emphasis on such things as the value and access to education, corporate contribution to the community, strategic business direction etc. When to use these types of benchmarking? Benchmarks for improvement and target setting. Process performance measures (quality, time and cost). Organizational enablers like technology, systems and structure facilitating the process. Gaps in perception of customers and company management. 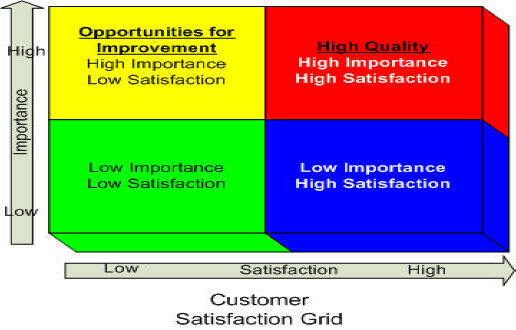 Basis for improvement leading to higher customer satisfaction. Basis for product and process related improvement like benchmarking and re-engineering. Any work process is made up of an input, repeatable process based on a method or practice, and an output. The practices deliver the output. If the practices are the best in the industry they will most fully satisfy customers. Benchmark metrics are the conversion of benchmark practices to operational measures. Use findings for continuous improvement. Focus area, key measures, and definitions are established and clearly documented. Research is conducted to identify the best-practice organizations to study. The best-practice organizations are selected. The study questionnaire is administered to all participants, and the site visits are conducted at the best-practice organizations selected in phase one. Analyzing trends and identifying practices that enable and hinder superior performance. Create action plans based on the study findings. Organizations refine this model to meet their needs as they become more experienced in benchmarking. 7.3 Benchmarking Six Steps recommended by GOAL/QPC. State the mission, purpose or goal of the function or department. List the outputs and customers for each. Identify major customers by value or volume. List the major customers' needs and complaints. Identify which processes affect these needs or complaints. Identify which processes add the most value and which add the most cost. (For competitive benchmarking) Identify which areas are subject to competition. Establish the metrics to be used. 10K, 10Q and other public financial data. Most of this data is available on one or the other of the financial data bases. Establishing a benchmarking agreement with a partner organization. Establishing a data collection plan and method. Becoming experts in the measurement of their own system. Preparing themselves by absorbing and cataloging all relevant public information. Summarize and interpret the data. Analyze the gap between your process and your partner's process. Project where future gaps will be. Analyze things that were not on the agenda. Develop key findings into new operational goals. When cost, productivity or quality is the metric under study, sometimes it is useful to look at the historical trend as well as the current gap. 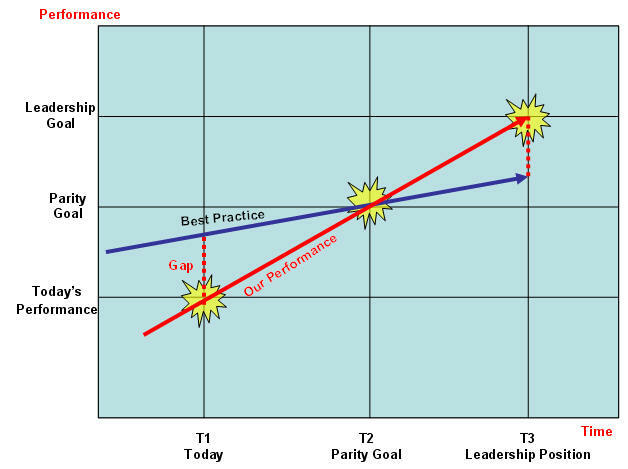 Projecting future performance levels of your productivity and the benchmark partner's, given the current rate of improvement for each, creates what we call the "Z Chart" of productivity improvement required to attain parity with your benchmark partner. Communicate the benchmark findings widely. Involve a broad cross-functional team of employees. Translate the findings to a few core principles. Work down from principles to strategies to action plans. The final step in any benchmarking activity is to complete the Deming Cycle of continuous improvement; that is, to plan for the next benchmarking project. Lessons learned in the benchmarking activity become the source for continuous improvement of the benchmarking process. These lessons should be documented and used as the basis for the new planning cycle. Benchmarking alone will not tell you what customers actually want. If your product or service is obsolete, no amount of improvements in production processes will make it competitive. Benchmarking is only of benefit if the improvement actions are implemented. Always seek to find out "how" a company has improved its performance, this normally comes from the people not the management (who will tell you "how much" performance has improved but not necessarily "how"). Always clearly identify your specific key areas of interest and stay focused on them. Plan thoroughly in advance - prepare detailed questionnaires to ensure that none of the key elements are missed. Be prepared to give a benchmarking partner more information than you receive. Remember improvements are continuous and benchmarks go out-of-date quickly. Your competitors' performance will probable continue to improve in advance of you own. Always remain honest and thoroughly professional - and you will be welcome to return for more information in the future. Be willing to give any information you get. Be prepared from the start. Act in accordance with your expectations. While this list of suggestions for the code of conduct may seem to be common sense, it is surprising the number of companies that fail to apply them. This results in everything from minor disagreements between individuals to major legal battles. Recognizing that the other companies are your partners and treating them as such is key to successful benchmarking relationships. Using benchmarking data as a performance goal. For example, they focus all of their efforts on cutting costs to reach a certain financial indicator, losing focus on the real goal. When a company attempts to benchmark before the organization is ready, it may not have the data to compare with its partners. Therefore, someone makes a “guesstimate” that does the company no good. Imitation benchmarking occurs when a company visits its partners and, rather than learning how the partners changed their businesses, concentrates on how to copy the partners’ current activities. Sometimes a company will agree to benchmark with a competitor and then try to uncover proprietary information while on the site visit or by use of the questionnaire. American Productivity & Quality Center Open Standards Benchmarking Collaborative research. An internationally recognized benchmarking authority, APQC offers access to best-practice research, metrics, measures and more. Data Mining Benchmarking Association (DMBA)™ is currently a free association of companies and organizations with data mining organizations. DMBA™ conducts benchmarking studies to identify practices that improve the overall operations of the members. PASBA™ mission is to identify "Best in Class" procurement and supply chain business processes, which, when implemented, will lead member companies to exceptional performance. White Hopleman-station house Grindleford hope valley. business process improvement (reengineering) handbook of standards & guideline. November 30 1995.vergin 1.0. USAID's history goes back to the Marshall Plan reconstruction of Europe after World War Two and the Truman Administration's Point Four Program. In 1961, President John F. Kennedy signed the Foreign Assistance Act into law and created by executive order USAID. Business finance magazine, Originally printed in the November 2000 issue of Business Finance. Prepared especially for: Mr. Rocco Cane Strategic Plans and Control Fiat Auto S.p.A. 10135 Torino, Italy. National Performance Review, March, 1996 Topic(s): Benchmarking & Best Practices, Government TQM, Reinventing Government. UN habitat-best practices data base in improving the living environment.